I just received my newley re-tooled Escape jacket, and I must say that I couldn't be happier with the quality and the fit of this jacket. I have been a fan of Escape from New York since I was 13 years old in 1981 and Snake Plissken is my favorite movie charcater of all time. I have always wanted the jacket that Kurt Russell wore in the movie while portraying Snake and now thanks to Magnoli, my long time dream has finally come true. This jacket which is a replica of a 1930's motorcycle / aviator jacket is the coolest jacket I have ever laid my eyes on, and I'm not just saying that because I'm a fan of the movie, but because this jacket is very streamlined and sharp and the style has not been worn in 80 years. So not only did Magnoli's people go back in time to bring back the badest jacket on the planet, they did it with perfection. It took several prototypes for the jacket to reach it's highest level, but all the hard wotk and dedication to make this jacket a reality has paid off. It is crafted in magnoli's high quality Vegetable tanned steer hide, that mimic's the look of horsehide without question. 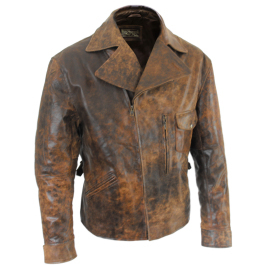 I recommend that anyone seriously thinking about getting this jacket, should get it in this special leather, as nothing else, but horsehide will do it justice. Thank you Magnoli.